Rinpoche will continue in Taiwan, giving commentary on Lama Choepa on March 12 – 13 at Hayagriva Center; teaching and Ksitigarbha initiation – March 19 – 20 Jinsiu Farlin; and March 26 – 27 at Heruka Center. From Taiwan, Rinpoche will go to Malaysia, first to Losang Dragpa Center for teachings on the 8 Verses of Thought Transformation, April 2 and 3. Then retreat on the 3 Principles of the Path at Jangsem Ling, April 8 – 11. 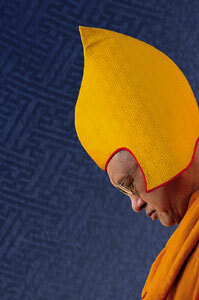 Rinpoche has accepted to give the Yamantaka initiation at Losang Dragpa Centre on on April 14 – 15. Next stop will be Amitabha Buddhist Centre, Singapore – April 23 & 24 teachings on the 3 Principles of the Path, April 30 – May 1st Rinpoche will give the Great Chenrezig initiation, and on May 7 and 8 the Cittamani Tara initiation. Rinpoche will also give either Heruka or Gyalwa Gyatso initiation in Singapore. Rinpoche then travels to Cham Tse Ling, Hongkong for teachings May 13 – 28. Then we move to July 9 – 10th, when Rinpoche will give a long life initiation organized by Guhyasamaja Center, USA. Rinpoche has started a new regular Dharma activity, whereby Rinpoche is personally offering 10 euros to each Wheel Turning Day to each Sangha member in FPMT’s Sangha communities. Another instructional opportunity to rejoice! Essential advice for all Dharma teachers and students! ‘On Dec 2nd, I went to Rinpoche’s house to perform a notary service. When I arrived at 6pm, Rinpoche and the Sangha at the house had just started to watch a DVD of His Holiness’ address to a huge crowd in Canada on “The Power of Compassion.” I was invited to join them. 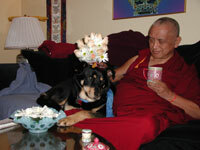 After the DVD and the completion of the notary service, Rinpoche asked me whether Ven. René was still at Vajrapani. Rinpoche mentioned that he heard the Kopan West course, led by Ven. René went very well. I told Rinpoche that everyone who hears Ven. René is quite inspired and feels he is a great teacher. Rinpoche then asked me if I had a piece of paper. I replied, “yes”. Rinpoche said, “Write down everything I said. 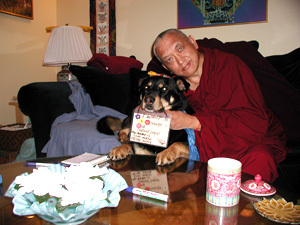 I want you to write down every word without missing.” Then Rinpoche laughed. PS: We have added this advice to the FPMT Resident Teacher’s Agreement (available in the Affiliates Area or from Claire). “Yesterday I was talking to Fabrizio on the phone. Fabrizio is a long-term Italian student who was a monk for many years. Lama Yeshe, who is kinder than all the buddhas of the three times, was quite happy that he was a monk and was happy with his practice, especially with his guru devotion. Fabrizio also speaks Tibetan quite well and is a very good translator. He is now offering service to Ribur Rinpoche, as well as translating Rinpoche’s teachings and initiations, and, most importantly, inspiring many people because of the great serious devotion to his guru in his heart and mental continuum; as well as his faith in the Dharma. Because of that, when he translates the Dharma the teachings become very effective, very moving for other people. Of course, when Ribur Rinpoche is teaching, every word comes from Ribur Rinpoche’s realizations and is very moving, very powerful. Recently, Fabrizio has been offering service to Ribur Rinpoche by doing gelato business. His father had a special lineage of making gelato so Fabrizio learned this and started a shop in California, the profits of which will help Rinpoche and other Dharma projects. Fabrizio’s parents had problems and wanted to sell their house to repay bank debts, but it was very difficult to sell and Fabrizio was very concerned and asked me to do a mo. I was chatting to him on the phone for some time. At the same time, I thought, in order to make the time useful, I should do something else. So I took the opportunity to go around many enlightened buddhas’ relics, relics of Lama Atisha and Nagarjuna, Buddha’s relics, relics of the previous Karmapas, Milarepa’s relic, Lama Tsongkhapa’s relic, as well as stupas that have the four powerful mantras—this means that each circumambulation purifies the five uninterrupted negative karmas: drawing blood from a Buddha, killing an arhant, causing a schism within the sangha, killing one’s mother or father. No question that it purifies the ten non-virtuous actions, directs one’s life towards enlightenment, and brings health, long life and other temporal benefits; as well as being able to achieve all the realizations, such as the three principals of the path, the thirty-seven aids to enlightenment, etc. So, while I was talking on the phone I was going around all the relics, pictures of Buddha, and tsa-tsas that I have piled up on a round table in my room. Then I thought, Roger and Holly spend so many hours talking on the phone, it would be very nice to have a stupa which they can go around. Also, this is my suggestion to FPMT International Office [and to all center staff]. Arrange some small stupas on a table. It can be many tsa-tsas, but especially you should have some stupas that contain the four powerful mantras, as well as photos of Buddha, statues, texts etc. It should be beautifully set up, very pleasing and inspiring. 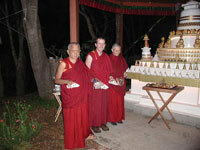 Make delightful offerings—flowers, water, lights and other offerings—around the stupas. The seven precious royal emblems and eight offering goddesses, carrying offerings, etc., can go around the edge of the table. The stupa could be either in the garden, in the middle of each room, or in the center of the building. Then, because people spend many hours on the telephone, they can take the opportunity to circumambulate as much as they can. Even if their speech is not virtuous, due to motivation the action of their body becomes virtuous; not only virtuous but the cause of enlightenment, the highest success, and, by the way, liberation from samsara, and happiness in future lives. For more information on this please see the letter I wrote to Ian Green about the benefits of holy objects (Benefits of Having Many Holy Objects, available to read and download at https://fpmt.org/teachers/zopa/advice/). In this way one’s life is not wasted; by doing circumambulations it becomes extremely profound. For example, Lama Atisha always traveled with a Kadampa stupa and circumambulated it very often. So, you can see that circumambulating is very, very important. If one’s speech is virtuous and, on top of that, the action of one’s body also becomes virtuous by circumambulating, one collects so much more merit; no question, then, if the action of one’s mind is also virtuous. This is why it is important to take the opportunity for one’s body, speech and mind to be virtuous as much as possible and put effort in that; because the nature of life is impermanence and death. The other thing one can do, as it doesn’t need two hands to talk on the phone, is to turn a prayer wheel with the other hand. This causes all the sentient beings to be purified. Beams emit from the prayer wheel and purify yourself and all sentient beings of the six realms. They achieve all the realizations, especially great loving kindness, compassion and bodhicitta; the whole path, the five wisdoms etc. Fabrizio explained that because Kyabje Ribur Rinpoche is not in California and has been away a long time, he was feeling very lonely. It looked like maybe he cried; he said he felt his life was meaningless. NB: the essence of this advice is available to read and download in the FPMT Affiliates Area, Center Advice from Lama and Rinpoche. ‘I want to benefit all sentient beings. 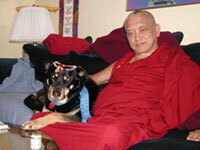 As you can see from the accompanying photos, Rinpoche’s dog is quite used to wearing Dharma additions from Rinpoche! Whenever you eat or drink offerings that have been on the altar (even after they have been offered), you should do this mantra to avoid pollution. At Rinpoche’s house they have a big bowl full of offerings, and a note of this mantra above to make it easy for people. This is Rinpoche with Vens Labdron and Matthew using the bug catcher created by Rinpoche so that bugs can be caught and circumambulated around the stupa. Rinpoche demonstrating use of the bug catcher.